First time at a station. 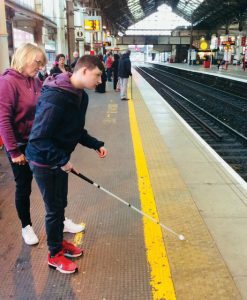 Young people with special educational needs and disabilities (SEND) often struggle to access public transport for a range of reasons, from sensory or physical needs to a lack of confidence. Most of the young people engaged in this programme had never travelled by train before, meaning that every stage that forms part of a confident and comfortable journey, from finding the station, to purchasing a ticket, to locating the platform, plus the travelling process itself, had to be learned. With this in mind, Community Rail Lancashire (CRL) developed two programmes, the Railway Confidence Programme (RCP), and the Railway Confidence Employment Experience (RCEE). The RCP was designed to develop confident rail use among young people with SEND aged from four to 18, with the RCEE aimed at providing young people aged 15 and above with an employment experience to assist them in considering career options in rail and community rail. 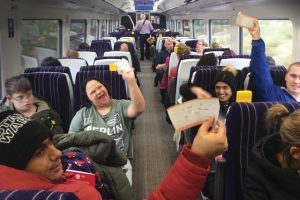 CRL works closely with Northern, the British Transport Police (BTP), Merseyrail, Merseytravel, and Transport for Greater Manchester (TfGM), across train-operating company (TOC) boundaries, ensuring young people with SEND have the resilience, skills, and confidence to use rail. Four to seven year olds during their RCP day. Since March, more than 300 people have accessed RCP and RCEE, with participants also playing a key role in other projects such as ‘Together we are tRAILblazers!’, and ‘Make a Beeline for the Station!’, which engage young people in responsible rail use. By giving young people the opportunity to access rail, the project team encouraged the idea of being passengers for life and building a more inclusive society. Through addressing factors that may have prevented rail use and providing strategies for overcoming those – such as visualising disruptions or planning journeys – the projects enabled independent rail use. Activities ranged from comic strip illustrations of ‘What to do when things go wrong’, to a bag-packing activity where the key message was not only having a ticket to travel, but also items such as money, medicine, or other essentials. 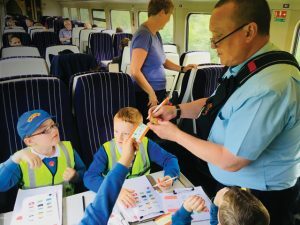 The scheme can be entirely tailored to suit groups and build necessary skills, as was the case for one group from Broadfield Specialist School in Oswaldtwistle, which had several students who were actively scared of train travel. This group required an eight-week programme of engagement to build up to a journey during which they could demonstrate their new-found abilities and confidence. The RCEE gives young people with SEND the opportunity to experience rail employment. The project team felt that for the future equality, diversity, and inclusion of rail and community rail, it was vital that all young people be given the opportunity to enjoy positive experiences within the industry. Working in partnership with Northern and BTP, the young people travelled to a key station location and met rail staff where they were given the opportunity to understand the different roles and responsibilities and ask questions about rail employment. The RCEE has had a 100% uptake rate with all schools contacted, with the RCP also experiencing a high level of engagement. Word of mouth and promotion by teachers across school cluster groups has enabled both programmes to spread rapidly.